Since its founding, innovation has been the hallmark of RTS Africa Engineering, a Tshwane-based company specialising in innovative technologies which provide solutions to industrial challenges. RTS Africa has not only imported many new technologies from its portfolio of well-established and highly reputable overseas principals; but, in-house, has developed ground-breaking solutions to industrial challenges such as the removal of dust from air flows. “In the day-to-day operation of industry, vast quantities of fossil fuel are burned,” explains Ian Fraser, MD of RTS Africa Engineering. “If the combustion process is inefficient, the result is wastage and pollution,” he explains, adding that the answer lies in finding a really effective method of monitoring certain gases in combustion emission streams. As a solution, RTS Africa Engineering became the distributors for the Norwegian company Neo Monitors several years ago. Recently, the company attended an update meeting Norway on the Neo Monitors’ recent technological developments. A key feature of Neo Monitors’ offering is its reliable and robust method of measuring the concentration of a single gas present in a mix of a number of other gases and dust. This capability is almost impossible with conventional gas-measuring technologies, which use probes inserted into the gas stream, Fraser explains. 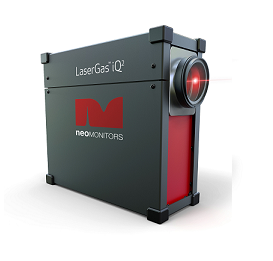 Instead of a probe, Neo Monitors LaserGas analysers use a laser beam which is transmitted through the gas in the flue or duct. The wavelength of the analyser is tuned to recognise a specific gas and to ignore all others. This cuts out cross-interference from other gases, dust or water vapour. The advantage of this instrument is that the electronics are mounted on the outside of the flue or duct and thus are not affected by the heat or corrosive qualities of the gas stream. LaserGas analysers can operate successfully in temperatures as high as 1500°C and will deliver accurate readings even with 90% signal attenuation. Highly reliable LaserGas analysers have application in a diverse range of industries including petrochemicals, steel production, power generation and cement manufacture among many others. Most conventional industrial gases as well as dust and water vapour can be monitored with one of Neo Monitors’ analyser models. Neo Monitors LaserGas analysers are based on tunable diode laser absorption spectroscopy (TDLAS), a technology which has gained wide acceptance in the industrial analyser market place in recent years. Their exceptional performance, selectivity, fast response-time and ability to measure selected gas components directly in the process stream offer unique advantages to the process engineer. More recently in industry, there has been requirement for in-situ, real-time multi-component gas monitoring. In 2016, NEO Monitors research division developed the LaserGas™ iQ², which allows for the measurement of four gases (O2, CO, CH4, H2O) and temperature with just one device. This cutting-edge instrument delivers vast benefits and reduced cost for industries requiring the most accurate analysis of processes. Previous analysers have at the most been able to measure two components in a given process. This capability will be of particular application in combustion control where the simultaneous monitoring of oxygen and carbon monoxide concentrations is essential to optimise combustion efficiencies. A further application could for example be in a sulphur recovery process: the simultaneous monitoring of hydrogen sulphide and sulphur dioxide in flue gases would allow for the optimised recovery efficiency and the limitation of sulphur dioxide emissions. “One of the most significant new developments from our side is that we can now measure some of the most problematic gases in combustion such as SO2 and NO and NO2; which we could not do before. From an environmental emissions control perspective, that is very important,” says Fraser. “In general, regarding Neo Monitors, whether there is a need to monitor the level of the single gas or multiple gases in a gas flow, Neo Monitors LaserGas analysers are able to make a vital contribution to both improved, more cost-effective and efficient production processes; and to a cleaner environment by limiting the effects of dust and chemical contamination,” he concludes.